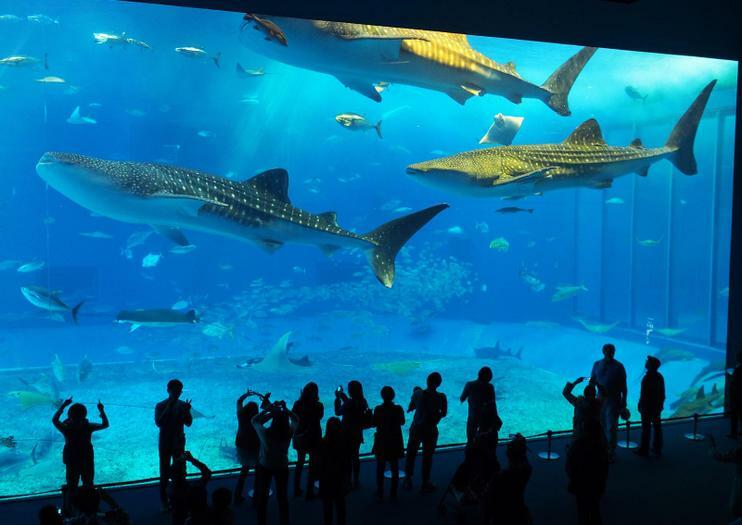 The expansive collection of underwater wildlife living in the Churaumi Aquarium includes some 740 species and 21,000 animals—like three massive whale sharks—that represent much of the marine life indigenous to the oceans surrounding Okinawa. Travelers can explore the dark hallways lined with illuminated tanks and uncover mysteries hidden far beneath the surface of the sea. From coral reefs to the famous black current, known by locals as the Kuroshio, visitors can get up close with all the animals that live down below and learn more about what makes Okinawa a unique destination. The aquarium is located in Okinawa’s Ocean Expo Park. It is open daily from 8:30 a.m. until 5:30 p.m. Entry fee is 1,850 yen for adults, 1,230 yen for high school students and 610 yen for elementary school kids. Hours: Daily 8:30 a.m.-5:30 p.m.
Save time waiting in line by booking your ticket to the Okinawa Churaumi Aquarium in advance. A must visit for lovers of marine life and families with children, the aquarium was the first of its kind to successfully breed manta rays and features tanks continuously supplied with fresh seawater. Ryukyu Village Tickets & Churaumi Aquarium TicketsSave with advance reservation set!※ You can move to Okinawa Churaumi Aquarium by yourself.※ The day of admission may be another day, but please drop in to Ryukyu Village before going to Okinawa Churaumi Aquarium.※ You can not redeem the set ticket at Churaumi Aquarium. Spend a day exploring Okinawa Island with a private driver and luxury minivan transport by Toyota Alphard. It’s the perfect sightseeing experience for first-time visitors to the archipelago’s main island. Customize the itinerary as you wish, or stick with a suggested schedule that takes in the rock formations of Cape Manzamo, whale sharks at Churaumi Aquarium, and the pristine beaches of Kouri-jima Island. Choose your own adventure during a flexible full-day private group sightseeing tour on Okinawa. Experience the unique culture of this Japanese island as you select from among activities like the UNESCO World Heritage-listed Shuri Castle, Churaumi Aquarium, and much more. Private vehicle transport and a driver are included, and an optional guide is also available. If you have limited time in Okinawa, orient yourself in luxury and customize your private tour to the needs and interests of your group. Choose from top attractions, with a recommended itinerary of Cape Manzamo, Churaumi Aquarium, and Kouri Island. Your personal guide meets you at your hotel with a comfortable Lexus for this 8-hour tour.